Speaking at the Northern League's rally, party leader Matteo Salvini accused the government of blindly fulfilling orders given in Brussels. The protest was held at Piazza del Popolo. "The problem isn't Renzi; Renzi is a pawn, Renzi is a dumb slave at the disposal of some nameless person who wants to control all our lives from Brussels," Salvini said. The rally was held under the slogan 'Renzi a casa' (“Renzi go home”). According to Salvini, it is ordinary people who suffer from the current government’s policies and the ones of the European Union. The politician especially stressed the situation surrounding Italian truck drivers who have lost their jobs. "Europe is what's allowing our truck drivers to be squeezed out by Romanian contracts, Romanian wages and pensions that can be used to come and work in Italy because that's what Europe wants – a race to the bottom," Salvini said. The politician also blamed banks and the Italian business establishment for the current crisis and economic problems. The Northern League's tough anti-immigration position suggests deportation of illegal immigrants. The leader of the party says that limited and controlled immigration is positive, but immigration through the rescue of migrants in the Mediterranean is a disaster. Numerous left wing activists call those views “racist.” Opponents of the Northern League from several organizations and Roman social centers held a simultaneous rally, protesting against the League's ideas. 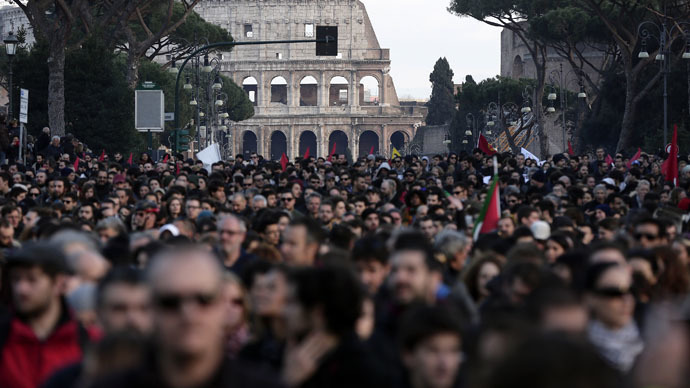 No incidents were registered at the rallies, according to the Corriere della Sera. The Northern League, or 'Lega del Nord' in Italian, is a regionalist political party which aims to leave the eurozone, change the policy of austerity, and control immigration. Over the last five years, the party has gained popularity and become one of the largest parties in the north of the country. However, the ruling center-left Democratic Party is still supported by the majority of the population. New regional elections are to be held this spring.